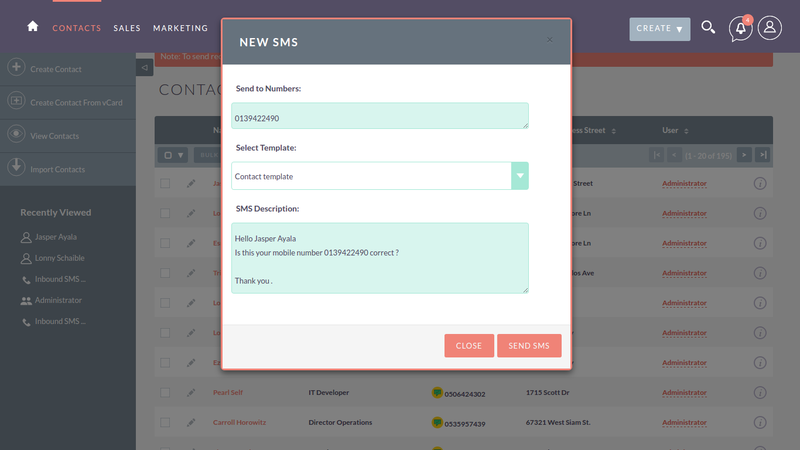 This integration for SuiteCRM that allows you to send SMS to any mobile number by single click on SMS icon from any module. You can send automated SMS to your clients on defined actions that's called workflow, and send bulk SMS from module's listview like Account, Contact, Lead and get a reply back as an Inbound SMS. No need to create different SMS Template. You can use Email Templates for sending SMS. This addon supports all SMS gateway of any country. Click to SMS From all modules. You can see the Outbound / Inbound SMS records in a Call module. 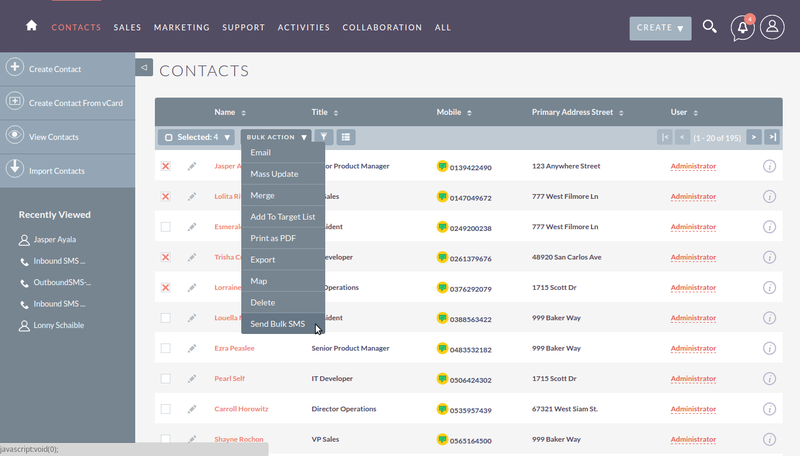 Send immediate SMS notifications to your Sales manager by WorkFlow when new Lead is assigned. Send immediate SMS notifications to your support engineer by WorkFlow when new Case is assigned. Bulk/Mass SMS feature for Accounts, Leads, Contacts modules from Listview. Auto Related Outbound/Inbound SMS to appropriate module record. Users Can see Notification when Inbound SMS is received. Can be used as a reminder for customers. 1. You can send SMS by click on the icon beside the numbers from Listview or Detailview. 2. Click on the icon it will open SMS popup window. 3. Select the Template that you want to send and click on Send SMS. 4. 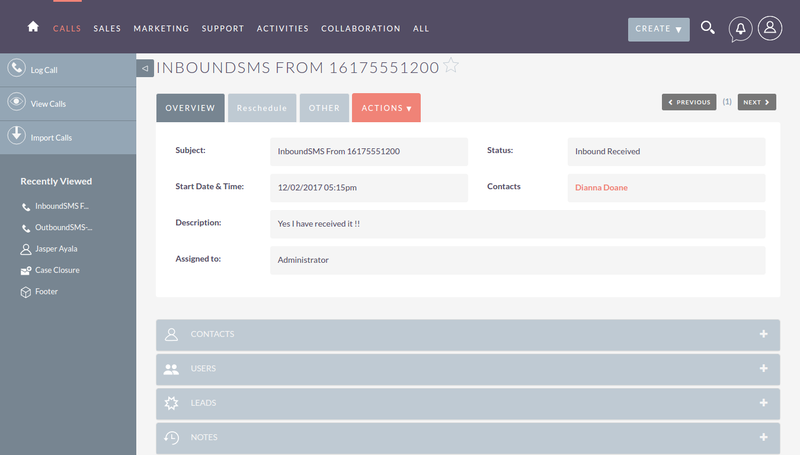 After the sending SMS, it will be logged in a Call module as an Outbound SMS record. Below we can see the modules Activities subpanel. All SMS Outbound / Inbound logs are related to that record. 1. Just goto Listview of a module and select the multiple records. now click on the Bulk Action menu and select Send Bulk SMS option. 1. When any client is replying then its logged as an Inbound SMS in a call module. 2. Users are getting notifications when inbound SMS generated and assigned to them. How users can see their Outbound / Inbound SMS. 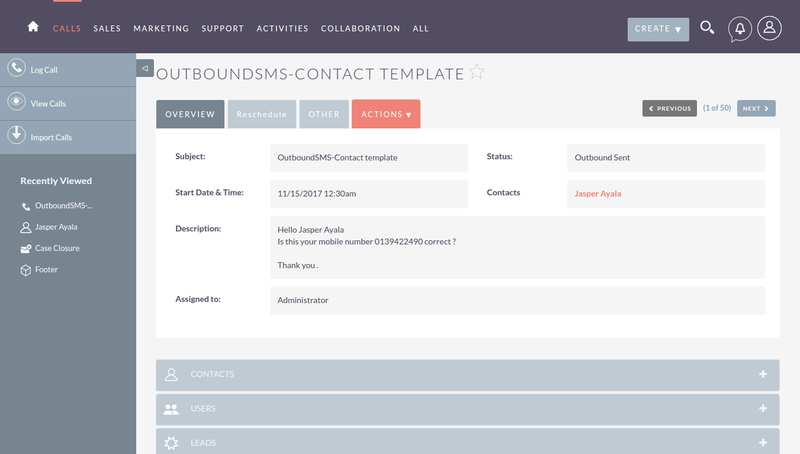 Configure the Inbound SMS settings.